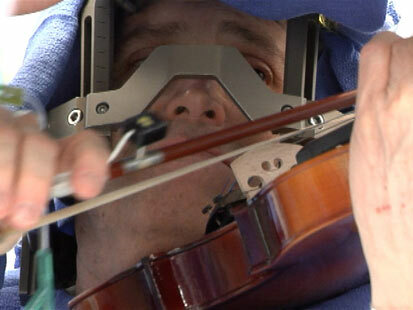 Violinist Roger Frisch played his instrument as surgeons performed deep brain stimulation. | LEARN TO PLAY THE VIOLIN FOR FREE! Violinist played his instrument as surgeons performed deep brain stimulation. Roger Frisch of Plymouth, Minn., lay on the operating table with his hands clutching his violin to his chin. While surgeons operated on Frisch’s brain, Frisch began to play the chords he’s known for more than 30 years. It seemed like a scene from a science fiction movie. But every note he played told the surgeons whether the electronic pulses they were sending to his brain worked to ease his body’s tremors. In June 2009, doctors diagnosed Frisch with essential tremors, a condition that occurs when sections of the brain that control movement start sending abnormal signals. Nearly 10 million Americans suffer from essential tremors, according to the International Essential Tremor Foundation. The condition most often affects hand movements, and simple tasks such as drinking a glass of water or eating become difficult. But for Frisch, a concert master with the Minnesota Orchestra, his right hand shook uncontrollably only when he held his bow up to his violin. Frisch hid his tremors for two years, he said. However, the shaking became apparent when he held out long notes in concerts. While it is not known what causes essential tremors, many experts believe it arises from abnormal signals in the brain. According to Dr. Michele Tagliati, division chief of movement disorders at Mount Sinai School of Medicine in New York, brain scans such as magnetic resonance imaging, or MRIs, and CAT scans cannot detect these types of tremors. “It’s a clinical diagnosis that we detect when we ask the patient to conduct a certain movement that will bring about the tremor,” said Tagliati. When other medical therapies did not work for Frisch, Dr. Kendall Lee, director of the Mayo Clinic Neural Engineering Laboratory, turned to deep brain stimulation — a surgical treatment that implants an electrode to send electrical pulses to the specific parts of the brain signaling erroneously. Lee and his team of surgeons found the area of Frisch’s brain sending abnormal signals and implanted two electrodes. That allowed tiny electronic pulses to be sent from a pacemaker-like device into the brain. “We can place a recording device in the brain and hear the tremors,” said Lee. While it is not known exactly how DBS works, many doctors believe that it stops the abnormal brain activity, which stops the tremors. “Just touching the brain at the right location oftentimes improves the tremors dramatically,” said Lee. Deep brain stimulation is a well-established treatment for essential tremors, but most patients are treated with beta blockers and other medications and don’t require surgery, according to Tagliati. “The percentage of success when the device is properly implanted is incredibly high. It’s a dramatic improvement that lasts for years,” said Tagliati. Since the brain does not contain pain receptors, patients can be awake during surgery and do not feel pain. The device is normally implanted while patients are under local anesthesia, but Frisch also underwent the surgery while playing his violin to let the surgeons pinpoint the exact spot to target in his brain with the pulses. “As I was lying on the operating table, they put the violin under my chin and as soon as they put the second lead in, I played,” said Frisch. via Cutting Edge: Treating Tremors Through Deep Brain Stimulation – ABC News.